A hearty Friday night supper, just right when evening starts to fall. Heat the oil in a medium saucepan. Tip in the onion and ginger and cook for a few minutes, until softened. Stir in the curry paste and cook for 1 minute more. Add the tin of coconut milk, then half a tin of water. Bring to the boil, then reduce the heat and simmer for 10 minutes. Add the prawns and chickpeas and cook for 5 to 7 minutes more, until the prawns are cooked and the chickpeas are heated through, then stir in the spring onions. 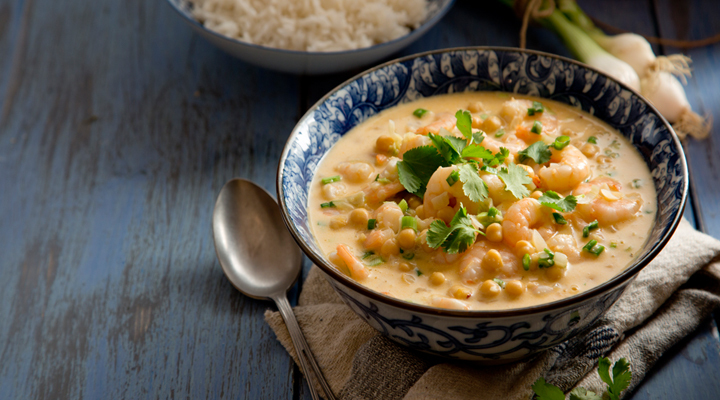 Serve with some cooked basmati rice and garnish with fresh coriander leaves.